Or ‘in the movies’ actually. I just found the IMCDB website aka Internet Movie Cars Database which allows you to search for movies and tv-series by entering a car’s make and model into the search field. So that’s what I did and then I sorted them out by importance/role with the most important one on top. Not that it’s hard to guess what movie that could be of course. Like. And for the Bullitt fans, I have a special around Bullitt coming up in a couple of days. Stay tuned. Wouldn’t you want this 4 panel painting in your living room? I know I would. You can have it in several sizes. 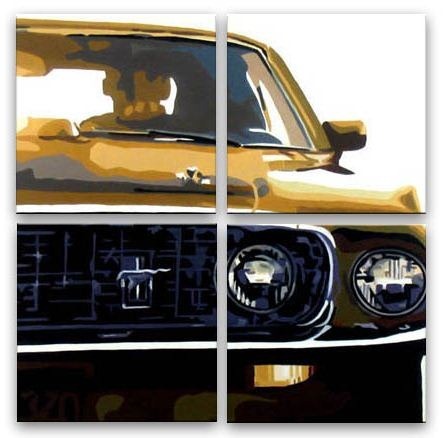 There are other Bullitt related paintings as well in case you’d like the idea but look for another image. It looks like they ship pretty much everywhere. I’m interested. Whenever they announced the new Knight Rider TV series would use a Mustang, that obviously sparked some interest with me. I blogged about it when it happened but didn’t get a chance to see it yet as I don’t live in the US. At Comic-Con 08 in San Diego end of July, they presented the Turbo Boosted Super Pursuit version of KITT… and what can I say, it’s fugly! What do you think? Oh and while you’re at it, if you’ve seen the series already, let me know if it’s any good please. That way I know if I should keep an eye out for it once it’s available here.